Exporter of a wide range of products which include careprost bimatoprost ophthalmic eye drops. Careprost works by lowering the pressure in the eye by increasing the flow of natural eye fluids out of the eye. The active ingredient bimatoprost ophthalmic belongs to a type of medication called prostaglandin analogs. Regulating eye pressure can help prevent blindness and treat certain types of glaucoma. Some people may also use the medication to thicken and lengthen eyelashes. 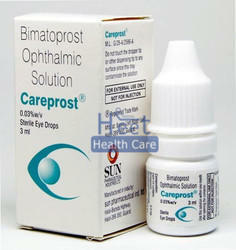 Careprost should be applied to the affected eye as directed by a doctor, usually once daily in the evening. Contact a doctor for the correct dosage and length of treatment as it will depend on the patient’s condition and their response to the medication. To apply the eye drops, tilt the head back slightly and pull down on the lower eyelid to create a small pocket. Hold the dropper above the eye, squeeze out a drop of medication into the eye and close the eye. Gently press a finger on the inside corner of the eye for about 1 minute to keep the liquid from draining into the tear duct. Careprost is not always suitable for all patients. Always consult your health care provider prior to using this medication if you are pregnant, breastfeeding, trying to conceive, using any other medication (prescription or non-prescription), using any herbal products or supplements, or if you have any allergies or other health problems.